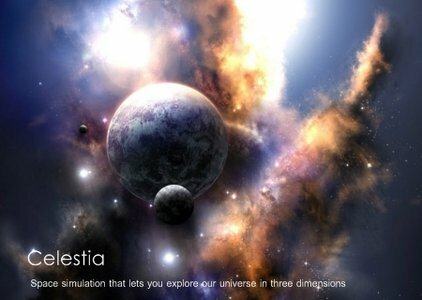 Celestia Extended Pack, special build programs based on Celestia 1.6.1, is real-time space simulation that lets you visually experience our universe in three dimensions. Celestia was the initial inspiration and creation of Mr. Chris Laurel, a Seattle, WA computer programmer who in 2001, decided to write a free software program to be made available to everyone on the world-wide-web that would place you in control of a virtual reality world of the universe. His vision and dedication gave birth to a program that is unlike any other space simulation program in existence. Celestia doesn't confine you to the surface of the Earth as do many other programs. Instead, Chris created a dynamic capability to travel throughout the Solar System and elsewhere in space, at any speed, at any moment of time and in any direction you choose. If you wish, you can fly via your own "hyperdrive" spacecraft to visit stars within the spiral arms of the Milky Way beyond the confines of our Sun, or leave the galaxy entirely to view the bigger universe from deep space. Chris also insisted this program would be scientifically accurate ... a true source of dynamic astronomical graphics.